“I am a resident at The Paramount. I can tell you that this is the greatest place I could have chosen; everyone is so nice. The medical staff and aides are exceptionally adept in their work. ; everyone is always cheerful. The activities are a pleasure to take part in. They have great social workers and an exceptional concierge. I have been very happy here for three years so far.” – Joan M.
“I am a unit clerk at The Paramount at Somers. What I like most about working at this community is the family vibe that I have been able to build with my co-workers and peers. In addition, I love being able to bring joy to the residents on a daily basis. Whether it’s singing to residents or telling a little joke to put a smile on their faces, even if it’s for just for a little while, makes working here worth it!” – Cynthia M.
“I have been with The Paramount for fifteen years in housekeeping. Working here and being around residents has given me great joy.” – Giovanna F.
“I enjoy working here at The Paramount as a CNA on one of our short term units. I have been working here for 15 years. I love the staff I work with; we are like a family. I find joy each day being able to take care of our residents – I feel much rewarded.” – Jenifer M.
“I am a patient here at The Paramount. I would like to express my feelings about my stay here. This is my second stay. Both stays have been a good experience for me. The staff is kind and helpful. They have treated me with respect. They have answered all my questions. They always check on me to make sure that I am satisfied and if I need anything. I have felt safe here and the staff makes every effort to get me stronger every day.” – Kim C.
“Dear Administrator, The Westminster Staff were a ray of sunshine today. Here are the details: I got smiles, nods, conversation, and laughs from everyone as they passed my room. I am thankful for each person. This is my second stay at The Paramount and although I was sad when I had a recent fall at home, I was happy that I was able to return to The Paramount. I was greeted by many smiling staff that made me feel comfortable and in good hands. The nurse aides are very helpful in meeting my specific needs and are always a pleasure to be around. The food service is good and accommodating to my preferences. The recreation staff were inviting and kept me supplied with plenty of things to do. Overall, my impressions continue to be good even for my second time around, and I have made many friends here!” – Felicia F.
“I have been very pleased with all of the staff. Being here opened up my eyes to all of the good work that the staff do for the patients. Especially for the patients who are more dependent on staff for their care. It’s nice to know that people do care.” – Janet H.
“The care here has been exceptional. 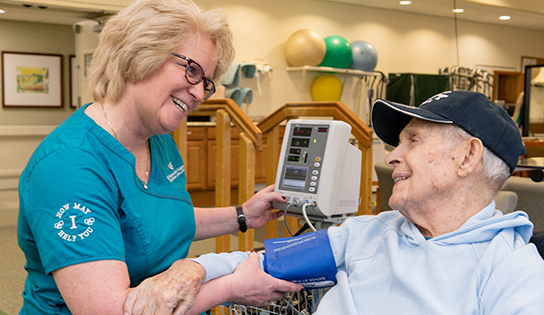 The staff and rehab therapists are great, and I’m really going to miss this place!” – Eleanor B.